You and I have been happy; we haven't been happy just once, we've been happy a thousand times. The chances that the spring, that's for everyone, like in the popular songs, may belong to us too -- the chances are pretty bright at this time because as usual, I can carry most of contemporary literary opinion, liquidated, in the hollow of my hand -- and when I do, I see the swan floating on it and -- I find it to be you and you only. 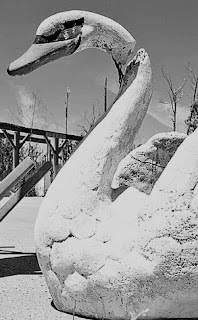 But swan, float lightly because you are a swan, because by the exquisite curve of your neck the gods gave you some special favor, and even though you fractured it running against some man-made bridge, it healed and you sailed onward. Forget the past -- what you can of it, and turn about and swim back home to me, to your haven forever and ever -- even though it may seem like a dark cave at times and lit with torches of fury; it is the best refuge for you -- turn gently in the waters through which you move and sail back.